The $240 million for Nunavut translates to about 48 new homes per year, says the president of the housing corporation. The president of Nunavut Housing Corporation says the $240 million contained in last month's national housing strategy will be a fraction of what the territory actually needs — only producing a few dozen more homes in Nunavut per year. Terry Audla says the new money, spread out over the next 10 years, only allows for "business as usual" and is not the cash influx the territory needs to catch up on its housing deficit. "That translates to $24 million per year, which comes to about 48 newly constructed units per each year," said Audla. "That's nowhere near [what's needed]." The money comes from the federal government's $40 billion, 10-year national housing strategy announced in November. Included in the strategy is $300 million for Northern housing, which was announced in the 2017 federal budget. Of that, $240 million is earmarked for Nunavut, $36 million for the Northwest Territories, and $24 million for Yukon. The government has promised to build 100,000 new affordable housing units across Canada in the next 10 years. Audla's estimate, of 480 new units over 10 years, suggests Nunavut will get about 0.5 per cent of the promised units across Canada. Currently, the housing corporation owns approximately 5,300 units across the territory — which is "nowhere near what is needed… for housing everyone in Nunavut," says Audla. The territory has been producing between 90 to 120 new units per year. "At the rate we're going — at 120 builds, and the current $240 million that was identified by the federal government — it would take us another 60 years to even address the housing needs in Nunavut," said Audla. He said he hopes the government will allocate more money to Nunavut to help address the crisis . "But at least it's a step forward," he said. "It's a beginning." All of the funding will go towards new housing, says Audla. "The priority is to build more homes," said Audla. "Every dollar we get from the federal government towards housing will be towards building new homes in Nunavut." But Audla said the territory will continue to do maintenance on homes that need renovation, from previously secured funding. 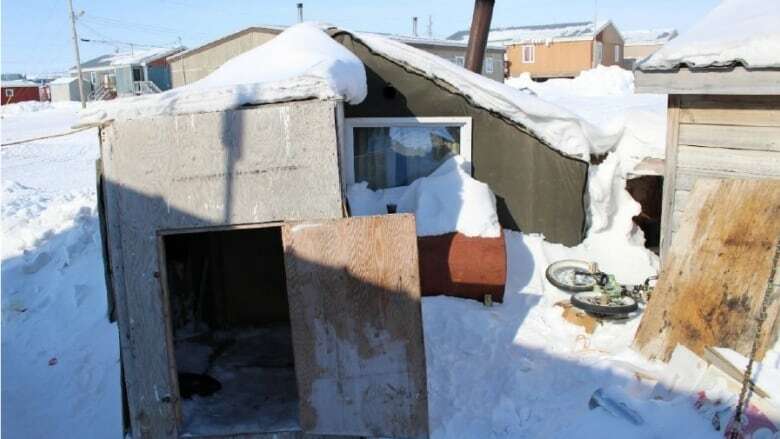 Many homes across Nunavut are in dire condition, some unsafe to live in. In May, CBC has reported that about 116 public housing units in Nunavut will need professional contractors, in Hazmat gear, to deal with mould build up. According to the housing corporation's annual report, the territorial government spent about $190 million each year since 2015 on operation and maintenance, which includes repairing and renovating homes. "The public housing stock across Nunavut, it is an aging stock," he said. "It is something we're trying to stay on top of." ​CBC IN FGH | Living with limited running water, 1 light bulb and a wood stove in N.W.T.